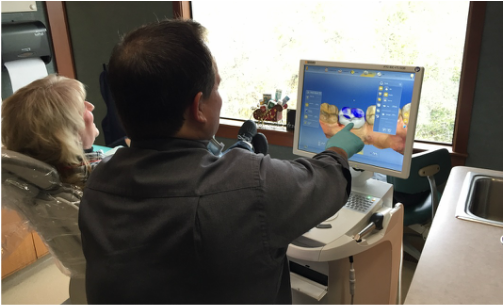 Tooth scanning technology has advanced at an astonishing rate over the last 10 years. When it first came out, it was difficult to use and took longer than the traditional impressions. While we were excited about the developments, we didn’t feel that they were good enough for our patients yet. Fast forward to 2016 and the technology is unbelievable. In less than 5 minutes we can scan your entire mouth with pinpoint accuracy. The scan is done with a small digital camera that uses no radiation. The computer software takes that scan and gives us a three-dimensional model of your mouth. 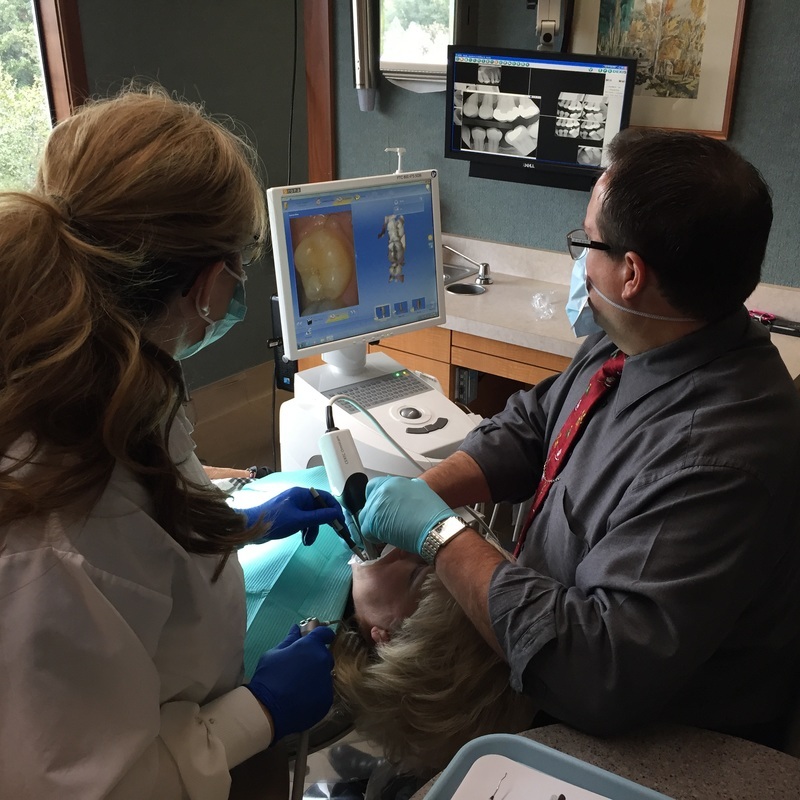 This whole process is done right in the dental chair with our mobile scanning unit. Once we have scanned your mouth, we prepare the tooth for a crown just like we used to. You’re numb as we reduce the tooth and remove any damaged tooth structure. Once we’re left with only the healthy tooth, we scan that area again. Using the before and after scans, we design your crown on the computer, sitting right next to you! You’re welcome to watch and ask questions as the crown being designed. The computer shows us where the crown needs to be thick or thin and where it will touch other teeth when you bite together. We can even open or close your virtual mouth make sure the bite is just right. The custom-designed crown is then sent to our milling machine in the lab. We encourage you to go watch the process. Even after using the machine for the last month, we still are amazed by it. Starting with a small block of crown material (different materials are used for different cases) the machine will mill it into a crown that fits perfectly onto your tooth. The milling process takes less than 20 minutes! After that, the crown is glazed and fired, to make it just as strong as your natural tooth and ensure that it’s the correct shade. Step 5: Placing the crown. Within an hour of your arrival at the office, we are ready to cement the crown. Just like a traditional crown, we try it on first to make sure you like how it feels. If the bite feels right and the shade matches the neighboring teeth, we bond the crown to the natural tooth and you are good to go. Just like that, in less than 2 hours you have a brand new crown! Same day crowns are a great service to our patients and we love how the new technology brings the entire process into our office. If you have any more questions you can ask to check out of virtual tour of the new equipment at your next visit. Be sure to check out our next blog post on what we believe are the many benefits of this technology. Be sure to watch this video that walks througheach step of the process. You can also read the reasons that we believe this new technology will be a great benefit to our patients.